Lock up your envelopes and your arty portraits of Brendan Rodgers! Guess who’s back in the bigtime! 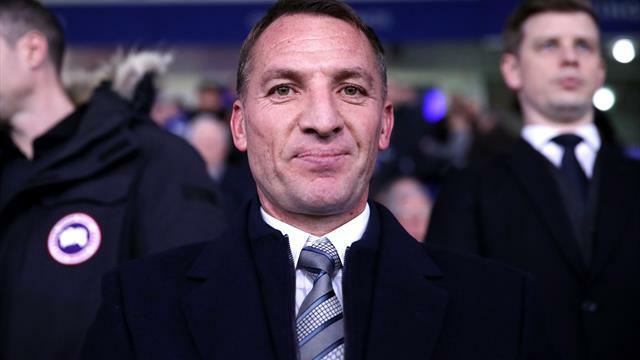 Yes, it’s, erm, Brendan Rodgers, now officially manager of Leicester City after what can only be described as a whirlwind romance of an approach. He was in the stands last night as the Foxes ground out a much-needed win over Brighton and will look to work his special brand of naff-uncle magic on a squad that has underperformed all season. “I’ll give my life to make the supporters proud of their club,” purred the 46-year-old with typical Brentian panache. It’s OK, Brendan, mate. We tend to draw the line actual human sacrifice. Just… y’know, be better than Claude Puel. Poor Maurizio Sarri. It’s one thing to be humiliated at Wembley. It’s another to be kept in the job when you know Roman Abramovich already has a filled-out P45 for you in his top drawer. But having to relive your lowest ebb over and over again in press conferences really must be galling. So that’s… absolutely bloody not, then, presumably? Except no, Sarri actually wants you to believe things are fine and that Kepa-gate actually improved his relationship with his squad. Although typing that last sentence has made The Warm-Up think it’s worth going over the footage again. There’s every chance Sarri was simultaneously blinking out the message RESCUE ME in Morse Code. Speaking of Kepa, he’s been fined a week’s wages and belatedly issued an apology yesterday. He could be left out of tonight’s game against Spurs, said Sarri, except he obviously won’t be, because this is Chelsea and his manager, like it or not, has all the authority of a work-experience kid at a prison. After (checks notes) two long months in the football wilderness, Jose Mourinho wants you to know that he’s back, back, back. Not in pure footballing terms, you understand, but as the world-class purveyor of self-delusion he has always been. “People used to say that you learn more with defeat. Maybe there is some truth in it,” Mourinho told , momentarily hinting that he might have had some great epiphany regarding his methods and his diminished standing in his sport. All very ‘specialist in failure’ from the Setubal Sulker, who still had the gall to claim that he is, in fact, a contemplative, glass-half-full kind of guy, who definitely, definitely doesn’t live off interpersonal friction like it were oxygen. Joy! Internal empathy! Truly astonishing stuff, and The Warm-Up doesn’t know which explanation is more bleak: either (a) that he actually believes this obvious nonsense, or (b) that he knows it to be rubbish but still thinks he can sell it to us. Either way, not great. Funny, but not great. No. No, no, no. This must be some kind of clerical error. So you’re telling me… nah, come on, I’m not falling for it. Huddersfield winning a football match: fine, that’s faintly believable, in a struck-by-lightning kind of way. But Steve Mounie scoring a goal? Absolutely didn’t happen. The tweet below must be some high-grade mock-up or the result of a cruel, low-wattage Russian hack, because this is the very definition of fake news. The Warm-Up has heard of cheap restricted-view seats… but restricted view television camera angles? That’s a new one. Go Brazil! Playing for your boyhood club at 21? Check. Nailing down a midfield starting spot? Check. Inspiring a run of form the like of which most fans could have barely imagined a few months ago? Check. Scoring your first senior goal in front of your own fans in a comfortable 2-0 win? House! Someone in the Longstaff family needs to convince him to play the lottery this week, because everything the kid touches turns to gold. So close! So very, very close. Djalma Santos, who redefined the role of full-back along with fellow Brazilian Nilton Santos during the 1950s and 60s, would have turned 90 today. He played over 1000 games for club and country, and was named as the best player in his position at three World Cups – an achievement only matched by Franz Beckenbauer and Philipp Lahm. It’s also 20 years to the day since a team last named an all-English starting line-up in the Premier League. Aston Villa were the brave holdouts, naming an XI of Michael Oakes, Alan Wright, Gareth Southgate, Steve Watson, Riccardo Scimeca, Ian Taylor, Paul Merson, Simon Grayson, Lee Hendrie, Dion Dublin, and Julian Joachim. In a subtle argument for open borders and internationalism, they were clobbered 4-1 at home by Coventry. It was a massive, massive 24 hours for Tottenham on the commercial front. First, there was this bizarro video for Audi, featuring Lucas Moura, Deli Alli, Davinson Sanchez, Christian Eriksen and… a chicken. Why? Goodness knows, and the result is one of the weirder adverts The Warm-Up has seen for a while. Somehow – SOMEHOW – things then took a turn for the even-less-edifying, with the announcement that Spurs have named an Official Supplier of Toiletries (their capital letters, not ours) for their new stadium. “Expertly blended in London, Molton Brown’s collection of signature fragrances, bath and shower gels, home and hand care luxuries have claimed iconic status thanks to their vibrant colours and bold scents,” read the least footbally football-club statement of the season to date. Lovely stuff. Now please excuse The Warm-Up while we intricately compose some vomit in our mouths and gulp it back down. Quick quiz question: what’s better than a full set of midweek Premier League fixtures? Answer: a full set of midweek Premier League fixtures AND El Clasico, of course! So we’ve got Arsenal vs Bournemouth, Crystal Palace vs Manchester United, Chelsea vs Tottenham, Liverpool vs Watford, Man City vs West Ham and Southampton vs Fulham, plus Real Madrid vs Barcelona in the Copa del Rey, all at pretty much the same time. Now you do have a multi-screen TV set-up at home, don’t you? DON’T YOU?